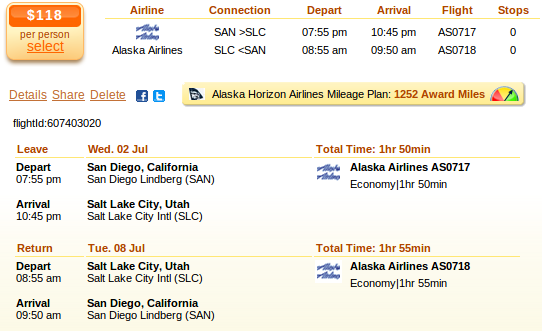 We have found an incredibly good Salt Lake City flight deal with Alaska Airlines for this July. Book now – before all seats sell out – and fly round-trip departing from San Diego for $118 including taxes. We have found this flight deal on Travelgrove, but it was originally provided by Cheapoair, Expedia and also HlightHub. To make sure you are booking the best offer for this route, search all the merchants from the box and compare their prices. On the below screenshot you will see all the info you need: the flight departs from San Diego International Airport (SAN) on July 2 and comes back from Salt lake City International Airport (SLC) on July 8. The Alaska Airlines flight is non stop both ways and flight time is about 2 hours in both cases. Alaska Horizon Airlines Mileage Plus, the airline’s frequent flyer program will reward you with 1,252 award miles. This entry was posted on Wednesday, May 28th, 2014 at 1:32 am and is filed under Airfare Deals. You can follow any responses to this entry through the RSS 2.0 feed. You can leave a response, or trackback from your own site.